The answer: Roncal, a firm, raw sheep’s milk cheese made in Spain. It has a full barnyard flavor, with grassy notes and an edible rind that left a spicy heat on the tongue. It would be fine out of refrigeration for 2 days, but I’d be at a hotel by nightfall. I envisioned snacking on crisp Washington apples as we drove into the sunset down the 101, just a knob of good cheese and the crash of nearby waves. Lucky for Eddie and I, this dream was not too far from the truth! When we got into LA late Thursday night, we did two things: unload the car and find a nearby grocery store. A lap through their cheese department (wasn’t I just here?!? ), and I was face to face with a wedge of Le Chatelain Brie. A cheese professor of sorts had recommended I try it, so into the basket it went. 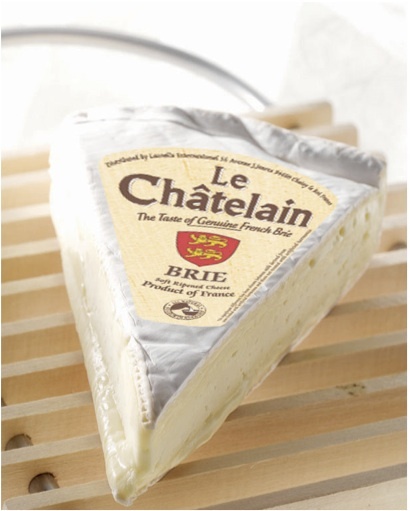 Le Chatelain is known in the States for their Camembert, which is creamy, smooth, indulgent and so funky. The Brie also has a bit of funk on it, but the flavor is more milk than stank, mellow, with a pleasant bloomy exterior. Le Chatelain Brie was absolutely fabulous and both cheeses went surprising well together. Sunday morning I sat on the patio with an espresso, a few slices of ripe juicy pear and my two cheeses of the moment. Life was good. Interested in cheese? Check out some additional recommendations! Four Cheese for Party Season, Cheese Facts and Beechers Dulcet and Broiled, Not Grilled Cheese.